There is a legend about a group of sages who once lived in a forest and practised occult rites by which they acquired supernatural powers. They hoped to attain final liberation by following the same practices. In this belief, they were mistaken, because action which is a part of these rites, bought out result as 'action' only and not liberation. Rites can produce occult powers but not the peace of mind implied in liberation, which is beyond all rites and ceremonies as well as occult powers and all the varieties of activities. Lord Shiva decided to make them realize that they were mistaken, and appeared before them in the body of a wandering monk. With Him, Lord Vishnu came in the form of a beautiful yound lady. When all the sages of the group saw this young lady, they were smitten with attraction towards her. Their minds were disturbed and there rites and occult powers turned dangerous for themselves. Moreover, their wives who were also living with them, fell in love with that strange monk. Getting angry by this, the sages conjured up a tiger and an elephant, with the help of their powers and sent them to attack the monk who was really Lord Shiva. He however slew them easily and used the elephant's hide for a robe and the tiger's skin as a wrap. The sages realized that the monk was some Great Being much beyond them in power and then knelt before Him for forgiveness and spiritual instructions. Lord Shiva in the body of that monk, then gave them advice that Liberation cannot be attained by action, but by renouncing 'action'. A poet by name Muruganar was writing this legendary tale of this group of the sages in Tamil language but when he started to write down the advice given by the Lord Shiva, he invoked Bhagwan Shiva to write them and help him. The Lord accordingly wrote the instructions in 30 verses in Tamil. 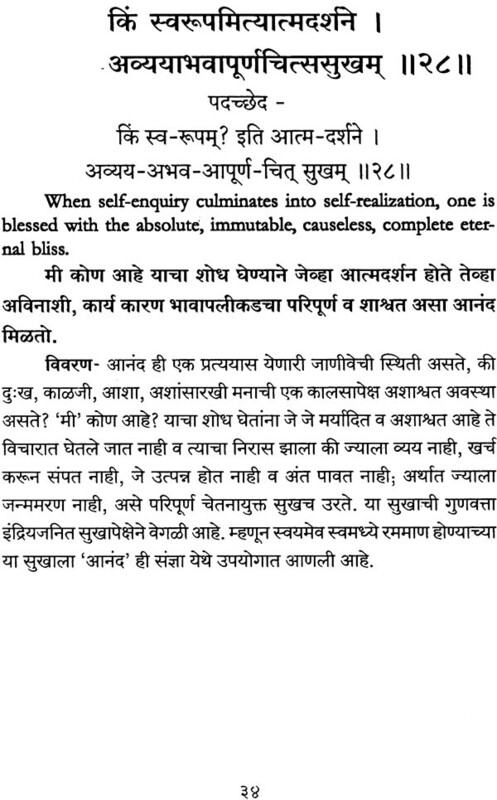 Later on Himself translated these into Sanskrit verses. 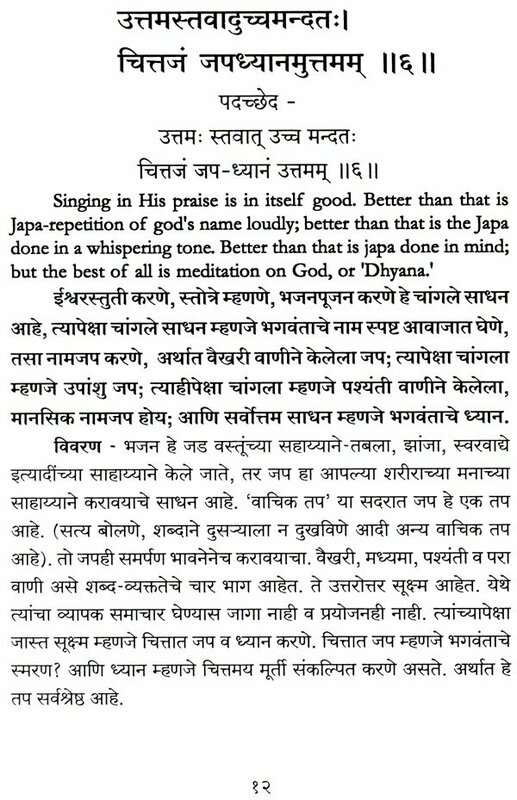 This Sanskrit version was then daily chanted in front of him, together with the recitation of Vedas, and even now, this pracice is front continued together in front of Lord's Shrine. Thus, it is treated as a sacred scripture. The Lord, in these verses referes to various paths towards Liberation, grading them in the order their efficacy and excellence and showing that the best path is of self- enquiry. Shri Ramana Maharshi was born as the second son of Shri. Sundaramier, in December, 1879. Shri Sundaramier was a pleader in Tiruchuzhi in Ramanad district. The name of Shri. 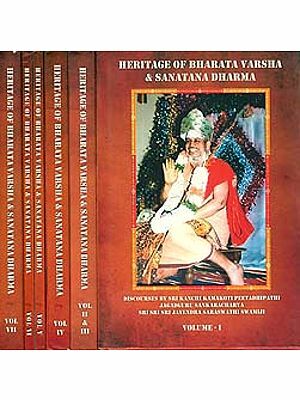 Ramana Maharshi was Venkatramana, given to him at the naming ceremony. He was educated in primary schools at Tiruchuzhi and at DindiguI and then he went to Madurai for further study in the Scott's Middle School and the American Mission High School. Sometimes Ramana sat absent - mindedly during school hours. Except this, his relatives and companions did not notice anything extraordinary in him. Why he was occasionally listless was a mystery to them, as he did not tell anything about it to anyone in those days. This young man was going deeper and deeper, without any guidance from anyone, into his own real nature. Even as a boy, he was asking himself such questions as 'Who am I?, 'What am I? ', 'Whence am I? ', all silently without any discussion with anybody. He had distinctly realized that he was not the mere perishable physical body, but something deep, subtle and having awareness and a feeling of reality. This was his own mystic achievement and understanding of philosophy. In addition, he had a deep and simple devotional feeling about 'Arunachala'. This holy name haunted his memory from childhood. For him, Arunachala was the symbol of God, with His omnipotence, holiness, kindness and omniscience. Ramana's father expired when Ramana was quite young and Arunachala was to him just like the father in heaven. Ramana did not know till 1895, where Arunachala was situated. In that year, a relative arrived at his house at Madurai. He said that he had just returned from Arunachala. When Ramana heard that name, he was startled. He asked his relative -"Are you coming from Arunachala? Where is it?" The relative was surprised at his ignorance and asked 'Oh! Do you not know Teruvannamalai? That is Arunachala." Young Ramana was having such deep attraction for Arunachala! He had naturally little or no interest in most of his subjects of study. Because of his negligence in studies, he was punished by his elders, putting some impositions, a task on him and giving him some warnings. But these had not produced any improvement in him. One day, for some neglience in studies, he was given as imposition to write some portions from Bain's English grammar. He was doing that job on 29th August, 1896. After some time he was bored with that work. He packed up the grammer book and the imposition paper, tossed them in the room and sat silent, closing his eyes, and delved deep into himself. His elder brother who was near him watched him quietly for a while and angrily rebuked Ramana-- 'What business has a fellow here, who behaves like this?' Ramana received the admonition very seriously. He though to himself_"Truly, I have no business here, I will leave home, relatives and everything here and go away for good." He resolved to go away to Tiruvannamalai, which was far away from his home. He intended to remain there totally unknown to anybody form his home and his relatives. He took out an amount of rupee three out of the money meant for fees and took a train northwards leaving a note at home which was as follows: 'As I am going to seek my Father by His command and as the object is meritorious, no sorrow need be felt for the absence and no money need be waster in searching for this"- - here he refered to his body in the third person. He refered to the Father, who commanded him to leave home and seek him. He even did not sign his note. At the age of 17 years, this was his development; unattachment and seriousness of purpose. In the train he remained absorbed in his own thoughts and was not attracted towards talkative fellow- passengers or the natural scenery outside. This went on till he reached Villupuram. As his money was not enough for all the travel, he alighted at Mahabaliputtu. From there, he went on foot for 10 miles to Tirukkoilur. There he pledged the only ornaments he had - a pair of golden ear-rings, got some money and again took train for Tiruvannamalai. 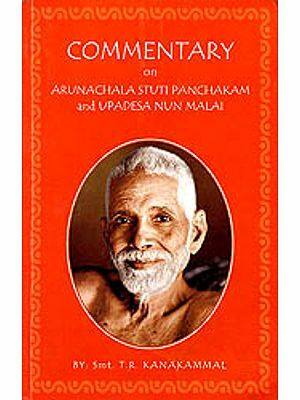 When he reached there, he found out the temple of Arunachala and offered himself to God with these words: "Father, by thy command have I come here before Th". Since them, he lived there for more than half a century in the presence of his Father, upto the time of his Mahanirvana on the 14th April, 1950. This hill is reserved as a sacred place, as a Jyotirlingam, i.e. God in the form of flame. For the first six months, Ramana stayed in the temple precincts and then went to stay near a saint's tomb in a mango-grove on the outskirts of that town and afterwards moved to various caves on the hill. Finally, he was staying near Paliteertha by the side of his mother's tomb, at the foot of the hill. His mother had come to stay with him from 1916 till she passed away in the year 1922. Ramana observed silence for the first few years of his stay at Tiruvannamalai. 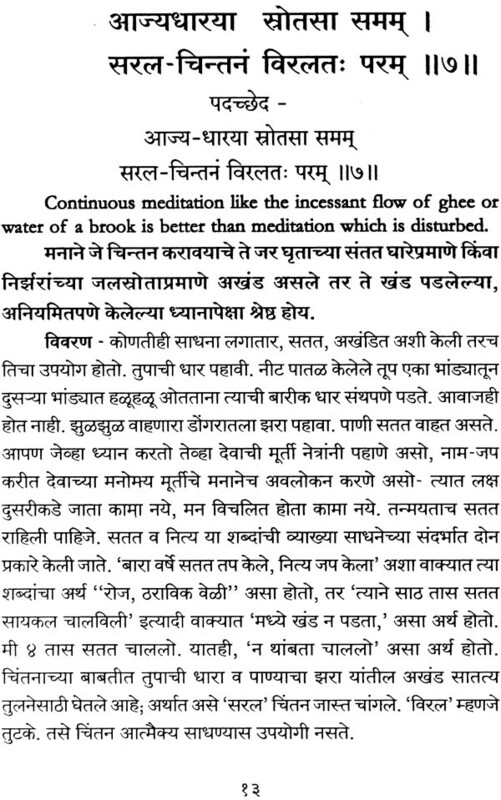 He had severe asceticism in his character and was in deep trance which was almost continuous. His fame as an ascetic began to spread and his relatives occasionally came to meet him. When they came, they always entreated him earnestly and tried to persuade him to return home, but he was determined and refused to leave Tiruvannamalai. During his stay he began to study many religious literary works in Tamil and Sanskrit and gradually attained considerable mastery on the subjects.